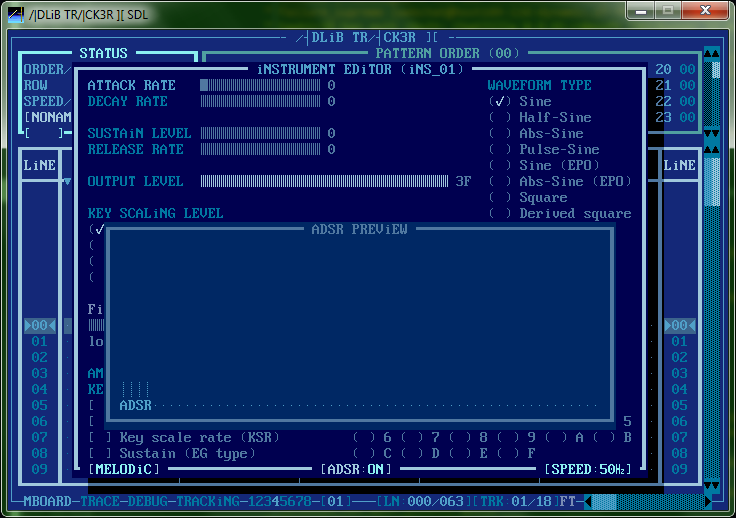 This article is about using Adlib Tracker II with ease. This will cover mainly basic stuff. Instruments, Patterns, Shortcuts, Effects, yadda yadda. Please download the latest build of ATII first. , again, unless you loaded a module first. 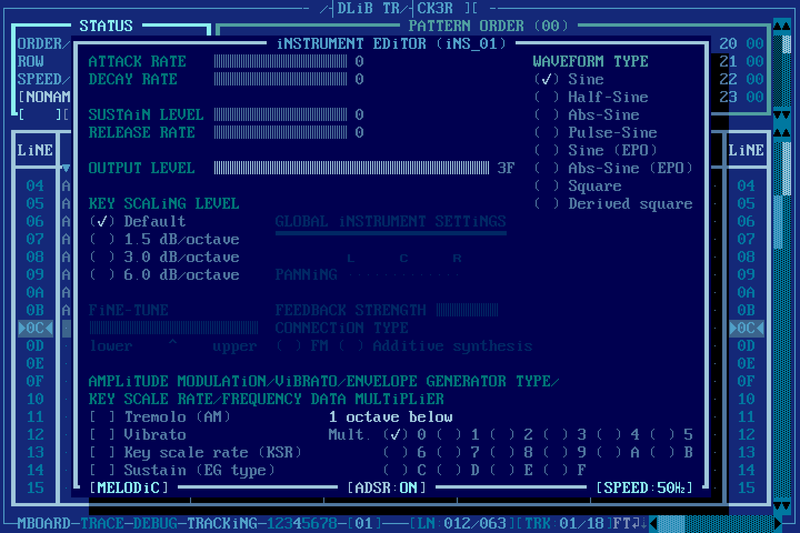 To edit the sliders (ADSR and Output level), use the Page Up/Page down keys. You can move your selection cursor around with the arrow keys, and select non-slider things using the spacebar. 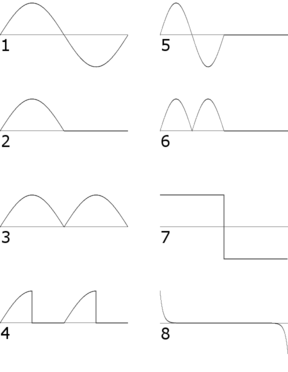 To make a simple sine wave, just raise the Attack on the carrier to maximum (F). You should note that there are 2 operators; Carrier and Modulator. Carrier produces the base sound, while the modulator just messes with the base sound by modulating it. If you want simple waves, then avoid the modulator. 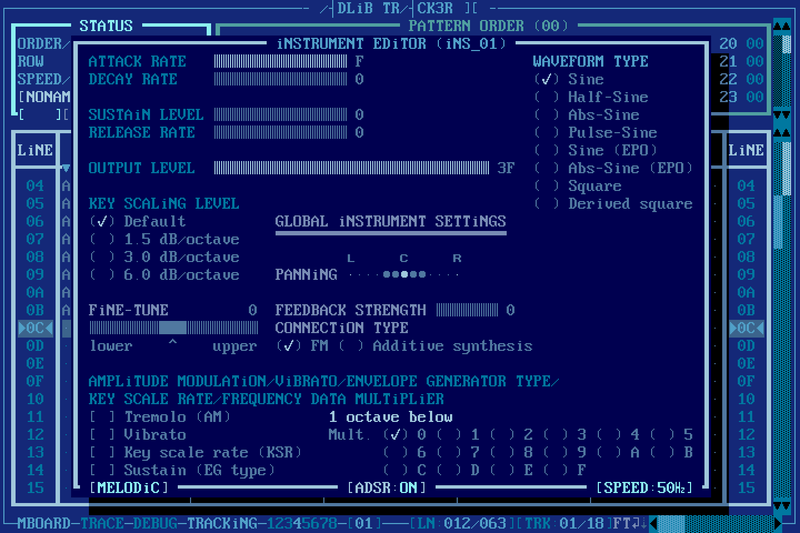 In ATII, editing the carrier will have cyan text, and editing the modulator will have some greyed out options and teal text. ADSR: I believe this is self explanatory. Attack, Decay, Sustain, and Release. Op. Vol. : Short for Operator Volume. Using this on the carrier will lower/increase the entire instrument's overall volume, while using it on the modulator will only decrease said operator's volume (also known as Modulator Level in Famitracker VRC7). 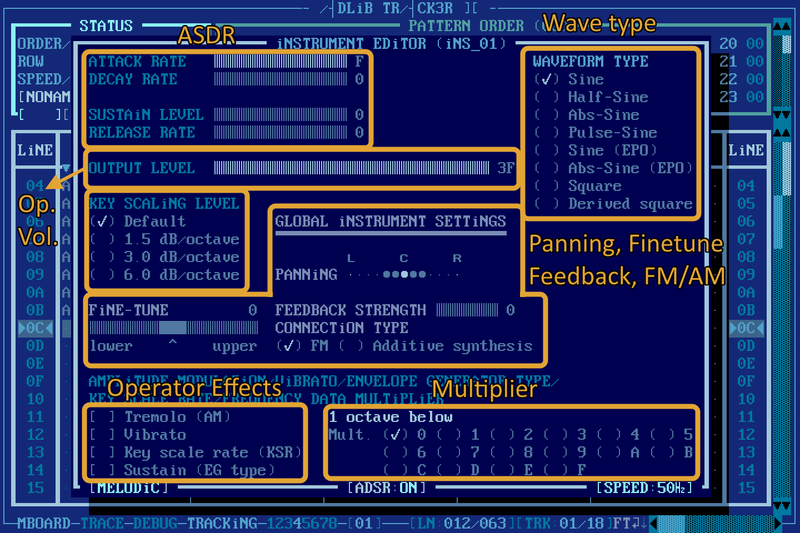 Panning, Finetune, Feedback, FM/AM: Global instrument settings. Panning is simple. Hard left, Center, Hard right. Finetune is also simple. Feedback is how much does the modulator affect the carrier, and lastly, FM/AM just chooses if the modulator should modulate the carrier, or if it should just produce its own tone. Key Scaling Level: This defines the volume difference between octaves. Useful for making sounds sound more silent at higher octaves. Multiplier: This indicates the pitch of the operator. The default is 0, even though the regular pitch is 1. Operator Effects: Self explanatory. KSR makes the instruments fade out faster, and also more silent if using a specific volume. Mess around with those until you get the sound you like.
. Notice how the latter has some greyed out options. This has been proven a difficult task for some. It's not! It's relatively easy, but you do have to spare an entire pattern for just the kick (or use macros), and an entire pattern for hats/snare drums/etc.
. You could also just use one of the preset kicks that ATII came with. Snare: This is more complicated. You have to use the modulator to generate "noise", having it quickly fade in from a normal carrier sine wave to give it some punch. 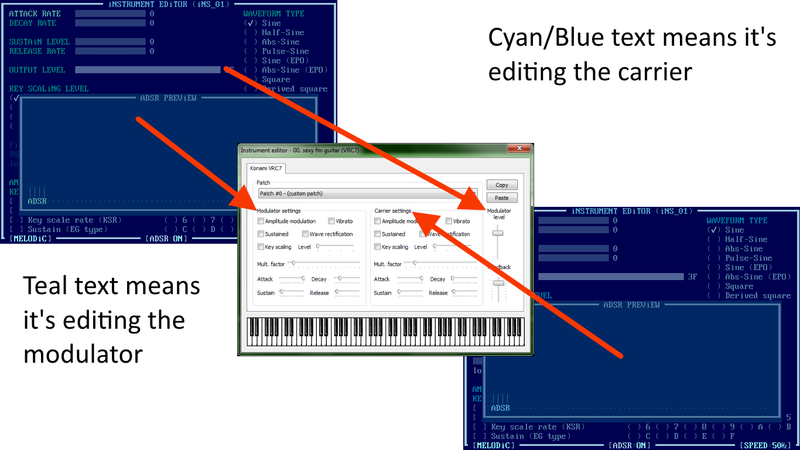 Here's how to make one if you just want to copy it.
. Alternatively, use a preset instrument. Hats: This works like the snare, except it quickly fades out, and doesn't have a fade-in part. Toms: : This works similar to the kick, but the fadeout is faster, and the downpitch isn't as aggresive. 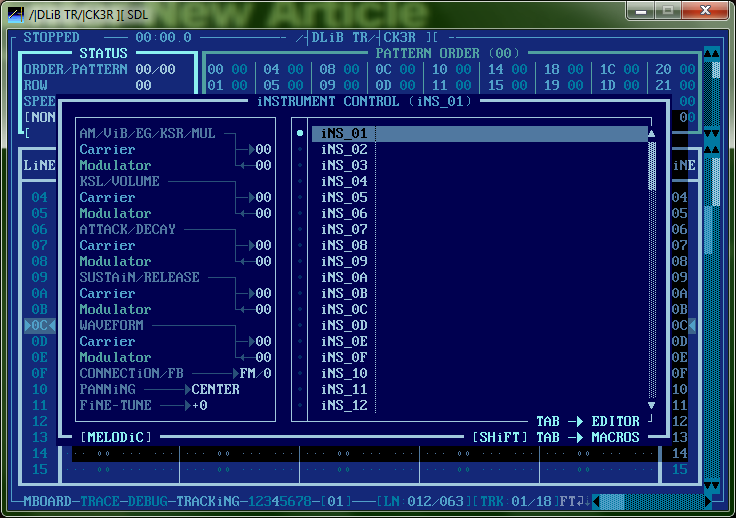 I should mention there is a drum mode for adlib, which spares 3 FM channels for 5 drum channels. If you don't want to spend time making adlib drums, then use this. As I said, if you're familiar with said chip, this will be piss easy. And there's a reason why. VRC7 is a derivate of the YM2413 (OPLL) , which itself is a stripped down YM3812 (OPL2). Here's a chart on how to port those VRC7 instruments. Ixx - Set carrier vol. The rest of the commands are combinations of 2 commands, if you'd like to use those, then consult the manual (by obviously pressing F1 inside the tracker).